We live in a competitive, global marketplace where businesses must scramble if they want to thrive. If your marketing strategies aren’t smart and current, you risk losing out to any number of competitors. No longer do you compete with the shop across town, but you are competing with all similar stores in other countries, as well. Small businesses face an uphill battle, as anyone, anywhere, can enter the marketplace by setting up an on-line storefront. Fortunately, there are some specific marketing strategies you can implement to take advantage of seasonal branding and stand out from the generic crowd. According to reports, holiday e-commerce spending is about $63.1 billion in the United States. Seasonal branding allows you to grab the interest of consumers and attract them to your small business. Here are seven ways your small business can use seasonal branding and get a slice of those sales all year long. You’ve likely noticed Google changes up their logo for various holidays, to celebrate the birthday of someone famous or to support a cause. Why not have a little fun with the season and swap out your typical logo for something a little more festive? Turn your letter “O” into a green wreath at Christmas, or make it into a heart for Valentine’s Day. Once you’ve created special logos, you can reuse them every time that holiday comes around. It shows people you have a fun spirit and helps you stand out from the crowd. You also might be interested in Microsites for Branding. In one research study, 70 percent of respondents indicated they like to follow their favorite brands on social media. It makes sense to market on social media during the holidays, when people are more likely to be gift shopping. Plan your social media campaigns ahead of seasons, so you’re touching on major holidays throughout the year, and you’ll never lack for something to post for your followers. Of course, Christmas is one of the biggest selling seasons out there, but you can tie into many lesser-known events that will help you stand out from the crowd. Look at a calendar of national holidays, and you’ll likely find at least a few events that make sense for your particular business model. There are hundreds upon hundreds of different national days, holidays and commemorations from which to choose. 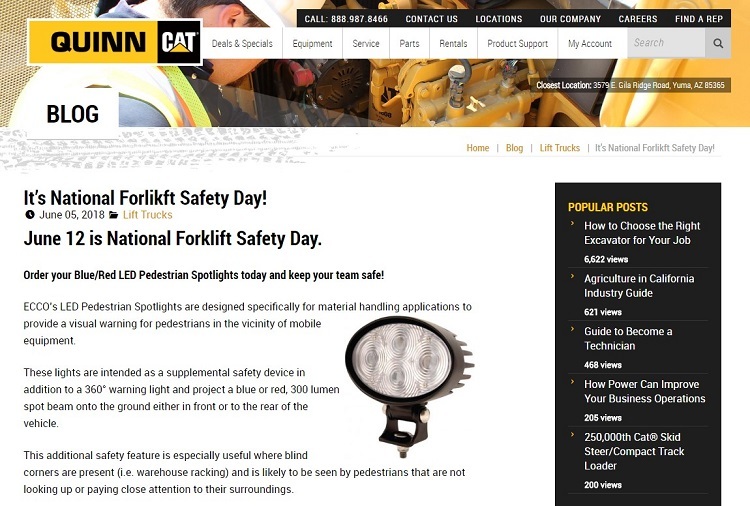 Notice how Quinn ties into National Forklift Safety Day on their website, which is the perfect match for the equipment and products they sell. In addition to offering forklift safety tips, they explain which of their products are most likely to keep your team safe and why. This is a brilliant marketing move on their part, because it offers a solution to a problem. Have you ever noticed stores tend to place their seasonal selections on clearance to make room for the more current items? This concept benefits brands on two levels. First, they move out any stock that didn’t sell quickly enough. Second, they bring in new and exciting products people are more likely to buy, since these items are current to consumer needs. Note how Bass Pro has marked down items for the end of the outdoor summer season. Boats such as kayaks and canoes are currently on sale, allowing them to move this inventory out and make room for fall and winter outdoor items as people begin making purchases with those times of year in mind. Big, bold yellow accents draw attention to the sale. As a season approaches, think through what types of questions and advice your customers are most likely to ask for year after year. How can you turn this information into a tip or tutorial and attract new customers? For example, if you sell backpacks, and every year you have parents ask how to reduce the strain on their children’s backs, offer a short class explaining what features to look for in a backpack to help with this. Or, hold a local try-on event where kids can test out the different backpacks you carry. It’s smart to have an editorial calendar and publish content regularly, both around various seasons and simple, evergreen content. Websites with between 51 and 100 pages of content get about 48 percent more traffic than those with fewer than 50 pages of content. ModCloth offers vintage-style clothing, but the thing that really makes them stand out is their blog filled with useful content, including images that show different ways to combine their clothing into cute outfits. They even offer recipes and DIY tips for various holidays. Some seasons just cry out for a party or celebration. Grab the attention of local media and influencers in your area by throwing an event and sending out exclusive invites. You can fit this in nearly any time of year. For example, if you sell children’s clothing, host a back-to-school bash. If you sell flowers, focus on wedding season. If you make custom signs, throw a party where they can order one-of-a-kind Christmas presents. Whatever the product, there’s a season that creates a perfect opportunity for you to tie into. The key to successful seasonal branding is the ability to tie into something current, but still make it relevant the rest of the year. When users search online or locally for events and sales, they are more likely to seek out your site initially because you focused on something seasonal. This timing can up your website traffic, but you also want to give them reasons to stay with your site even when that particular season or sale is long over. Great post Lexie, Keep up doing great work.